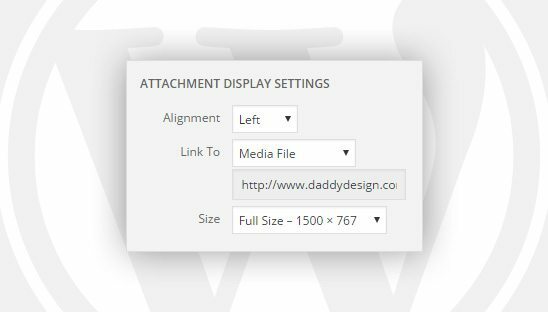 By default the attachment display settings for uploads in WordPress are normally set to the following; Alignment: Left, Link To: Media File, and Size: Full Size. This is fine for some but for others the biggest annoyance comes from having to constantly change these default settings to the preferred settings each time an image is inserted into a post. Sure you could use a plugin to override these settings but why install another plugin when it’s not necessary? In this tutorial we will teach you how to override the default attachment display settings in WordPress without using a plugin. PLEASE NOTE: Make sure to change “yoursite.com” to your domain. WARNING: Do not change any other setting on this page unless you know what you are doing, serious damage can be done. It’s always a good idea to perform a backup before attempting any changes to the options.php page. This setting will change the default alignment option which is normally set to “Left”. To update this setting, simply enter one of the available options below. This setting will change the default attachment link option which is normally set to “Media File”. To update this setting, simply enter one of the available options below. This setting will change the default attachment size option which is normally set to “Full Size”. To update this setting, simply enter one of the available options below.